Learn about the Flir E8 Point-and-Shoot Thermal Imaging Camera for building or home inspection. Includes pricing, features, and FAQs. The Flir E8 Point-and-Shoot Thermal Imaging Camera is a high-resolution thermal imaging camera for electrical, mechanical, and building inspection. The automatic camera features MSX Image Enhancement and various image modes. Pros: Compact and durable, excellent image quality, stores radiometic data, built-in digital camera. Cons: No WiFi, touchscreen, and voice annotation. Bottomline: Affordable, quality thermal imaging camera for home and building inspectors. Allows you to detect the slightest differences in temperature. The Flir E8 Point-and-Shoot Thermal Imaging Camera retails for $2,999.99. Where can I buy the Flir E8 Point-and-Shoot Thermal Imaging Camera? You can buy the Flir E8 Point-and-Shoot Thermal Imaging Camera online from sites like Amazon, or directly from Flir.com. What are some Flir E8 Thermal Imaging Camera alternatives? 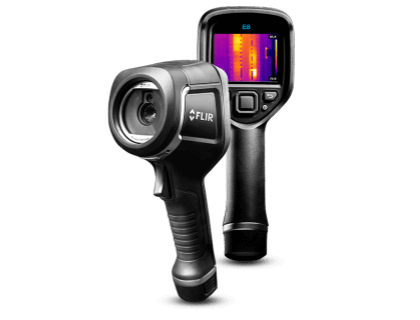 Flir C2 Powerful and Compact Thermal Imaging System.